THE MISSION is pleased to announce Plane Figures, a group exhibition featuring paintings by Natalia Cacchiarelli (Buenos Aires, Argentina), Jean Alexander Frater (Chicago, IL), Cole Pierce (Chicago, IL), and Michelle Prazak (Lima, Peru). There are many familiar abstractions: monochrome, cubist, color-field, geometric, expressionist. The early evolution of these forms was often described as a flight from the concrete image, freeing painting from Malevich’s “dead weight of the real world” into a universal, even spiritual, experience of shape and color. Conversely, the relevance of these modes to a contemporary generation of painters is often referred to in the very material language of the body and the body’s relationship to this previously forsaken space of the real world. In Plane Figures, artists working in Argentina, Peru, and Chicago are brought together by a shared interest in abstraction as a phenomenological, first-person experience of painting’s two-dimensional plane. Cacchiarelli, Frater, Pierce, and Prazak are each committed to the figure of the viewer, and the capacity of painting to renew or rearrange her perception in essential ways. In a selection of works that engage the history of geometric abstraction and op art, the artists boldly manipulate or violate the conventions of these styles in visceral ways. 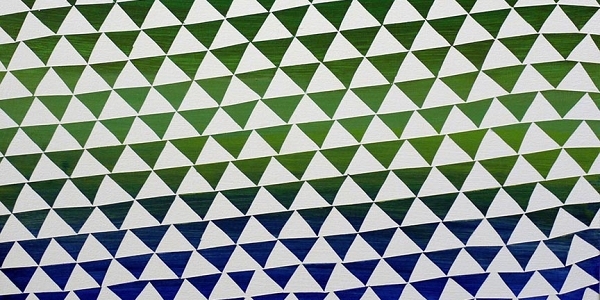 Triangles, grids, cubes, and patterns appear and are deformed by imperfect geometries, rhythmic color-modulation, and gestural or accidental marks. These artists variously assert the relativity of vision and the representational, rather than non-objective, impact of planar figures. Natalia Cacchiarelli (b. 1971) received her BFA from Escuela Superior de Bellas Artes Prilidiano Pueyrredón in Buenos Aires. She has recently exhibited at Centro Cultural Recoleta and Galeria Palatina in Argentina. In 2014, THE MISSION showcased Cacchiarelli’s paintings in Vibrations, her first solo exhibition in the United States. Cacchiarelli lives and works in Buenos Aires, Argentina. Jean Alexander Frater (b. 1972) received her MFA from the School of the Art Institute of Chicago (SAIC) and received her BA in Philosophy at the University of Dayton. She has recently exhibited at SpaceCamp Micro Gallery in Indianapolis, IN, Rockford Art Museum in Rockford, IL, and Watershed Gallery in Ridgefield, CT. Plane Figures is Frater’s first exhibition at THE MISSION. She lives and works in Chicago, IL. Cole Pierce (b. 1978) received his MFA from Northwestern University and received his BSS in Art and Sociology from Cornell College. He has recently exhibited at ROMAN SUSAN, Johalla Projects, Hinge Gallery, and Antena Gallery in Chicago. Plane Figures is Pierce’s first exhibition at THE MISSION. He lives and works in Chicago, IL. Michelle Prazak (b. 1977) received her MFA at Central Saint Martins College of Art & Design at the University of the Arts London and received her BFA at Escuela de Arte Corriente Alterna in Lima. She has recently exhibited at Sicardi Gallery in Houston, Galeria FORUM in Lima, Museum of Fine Arts in Houston, and Nylon Gallery in London. Prazak exhibited her first US solo exhibition, Movements in Time and Space, at THE MISSION in 2012. Prazak lives and works in Lima, Peru.